PUTTING ON A “KILLER BARBECUE” | Cook, Party, Enjoy! I try to make each gathering at our house eventful and fun. The only thing you need to do to make sure your guests have a good time and remember the night is to serve delicious food (and that doesn’t mean it has to be fancy) and plan the party so that you can be part of it and your guests feel like its business as usual. People love to be somewhere they feel comfortable, where they can relax and be themselves. Keep it simple and fun and your guests will love it! Decide on WHO YOU WANT TO COME. Make the decision if this is an adult only or family Barbecue and plan your guest list accordingly. Once you have your guest list decide on your theme. 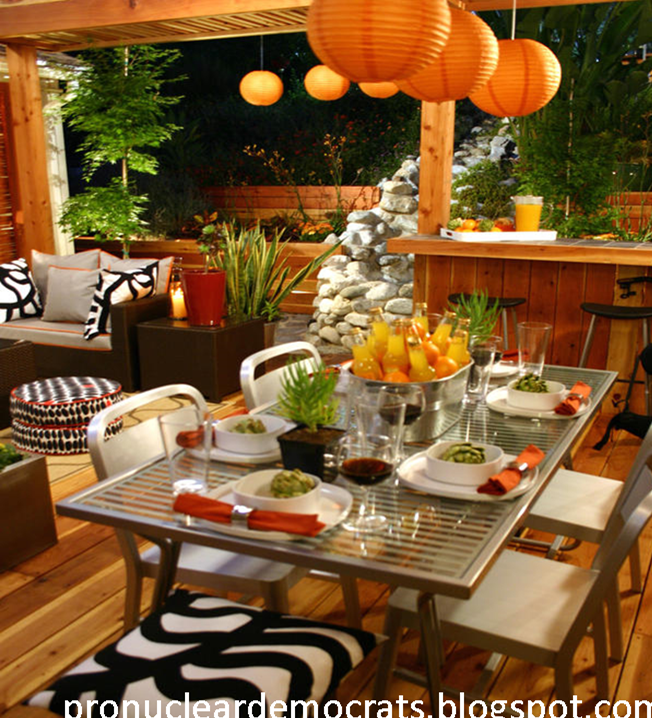 Get Festive, make your Barbecue stand out. An easy way is to choose a color scheme and coordinate your plates, napkins, table, and décor or maybe you want to go a step farther and pick an event or location theme. How about a Hawaiian luau with lots of flowers and luau décor (great resource is Oriental Trading) and menu. 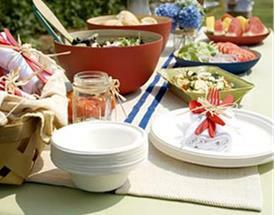 Or a beachy theme might be more to your liking, surf and turf, crab feast or a clambake could be fun for everyone. 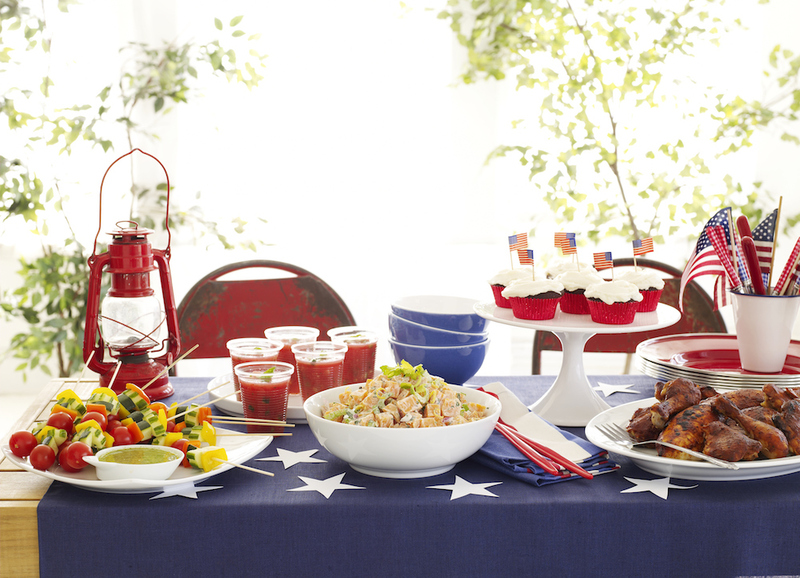 And don’t forget a good ole American hamburgers and hotdogs with gingham and lots of potato salad, and chips. 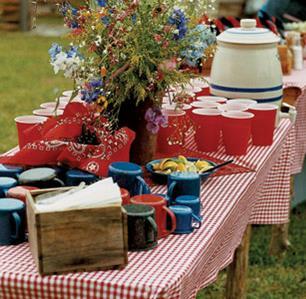 You can never go wrong with Steak Menu and 50’s Cookout Theme. Themes allow you to make a statement without too much work. A thought out tablescape based on your theme selection puts your guests into a party mood and lets them know you are glad they came. Music is also a Theme so consider your favorite artists and go with that. Even if you don’t have music as a theme it is always a good idea to have music playing in the background. Choosing your theme will help you to plan your menu too which can sometimes be a hard choice. Your theme makes it much simpler. Now use your theme to design your invitations. E-mail is a very acceptable way to contact and invite your guests. Digital “e-vites” are available on for free on many websites and allow your guests to rsvp easily. Make sure you include all the details of your Barbecue date, time, place, dress, and of course adult or family. You can also let your guests know if they should bring a side dish, people love to bring something so if you want some help with the party tell them what to bring. Don’t leave it up to them to guess what to bring make it easy for them tell them what you want or if you know they have a signature dish that is to die for ask them to bring that. By letting each guest know what to bring you don’t end up with a lot of duplicates and your menu stays true to your theme. This is also the perfect opportunity to ask about any food allergies or restrictions. 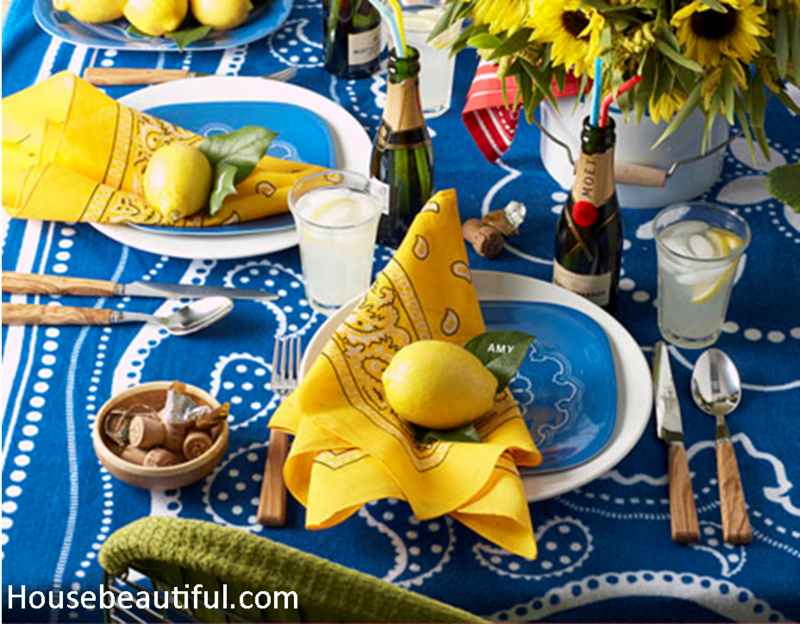 Colorful tablecloths or material can inexpensively brighten up eating spaces. If you don’t have any table cloths consider using material. You would be surprised how inexpensive material is and it usually is 35 to 64 inches wide and you decide on the length. Walmart usually has scads of material for as little as a dollar a yard. Stylish with paisley and bandanas. If you’re going for a country look, add rustic-touches using burlap and ribbon and vintage rustic looking serving ware. If you want things more sleek, opt for modern colors, simplicity, and angular serving pieces. Modern colors and dishes set the mood here. 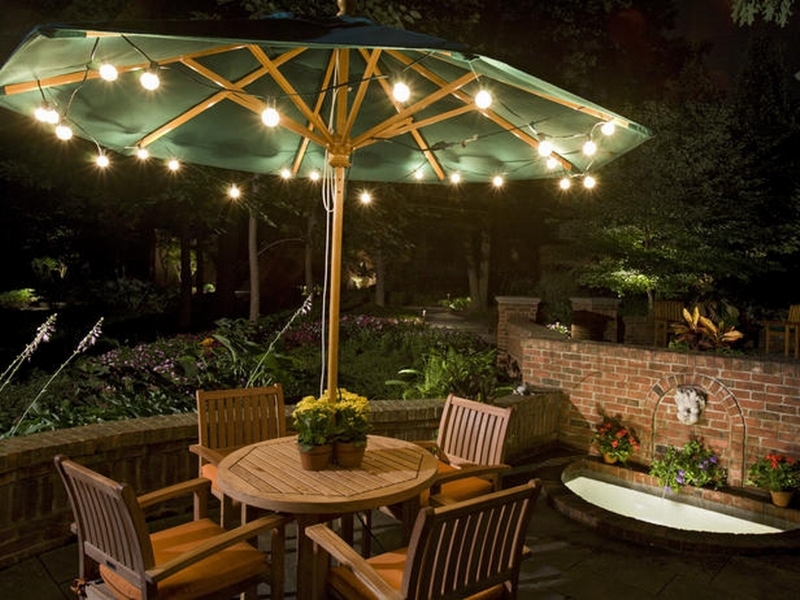 lighting for under your patio umbrella is available to purchase or you can use Christmas lights. And as the sun goes down, and darkness approaches you’ll want to add lighting. Citronella candles will keep unwelcome bugs away and provide additional lighting, while twinkling white Christmas lights add light and ambiance, candles or lanterns will give a more intimate glow to the setting. Those glass cylindrical vases from the dollar store make wonderful candle holders. 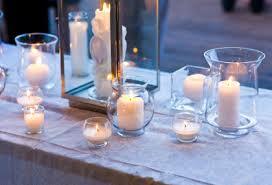 Drop some sand in the bottom position a candle and viola’ mood lighting will help your outdoor space feel cozy. Plan your menu to fit your theme and your guests. Consider how many guests are coming and plan your quantity of foods accordingly. I usually allow 2 main dish items per person and then a serving of each side dish available per person. That is assuming that everyone will eat that amount. What usually happens is that it turns out just about right because of the difference in people’s appetites. Chips and dips I figure separately. For smaller groups, you can add more detail to the menu — offer specialty breads like ciabatta or baguettes instead of the usual buns, or a nice selection of cheeses to make the meal more upscale. While the star of barbecues is most likely the grilled meats, side dishes have their place in the limelight too — especially if you have non-meat eaters in the group. Offer summer fruits and vegetables like black berries, strawberries, sweet corn, heirloom tomatoes, watermelon. Easy watermelon gazpacho, grilled herbed sweet corn, three bean salad, tomato salad or summer veggie kebabs all use in-season favorites and are easy to fix and a delight to eat adding lots of pizazz to your barbecue fare. This is becoming the way to go. It reduces your stress and expense plus no one is stuck making drinks. Yes it’s true you can throw some drinks in a cooler and call it a day, but to make your barbecue memorable, why not select a special drink to serve guests? Try classic lemonade or one of the new recipes for lemonade with a twist. If you are serving cocktails opt for one to keep things easy like refreshing sangria or wine spritzers. And always especially here in the South good ole sweet tea is a barbecue favorite and is a tasty, easy option especially if you add a garnish of mint, lemon, basil, etc. Kids can make or break and event. If there will be children at your party, offer activities they can keep busy with while the adults spend time together. If the children are young a craft table set up with assorted “easy to do crafts” is always a winner and allows the kids to make something to keep as a memento of the event. One of my favorites is using those puff balls and letting them create creatures with them. I supply wiggly eyes, construction paper, sissors, glue, and pipe cleaners so they can let their imagination go wild. Big kids like this too. Or set up an outdoor theatre and let them watch a movie. If the barbecue is early in the day and it is hot, water activities are always a BIG hit and will occupy most children of all ages for hours. Water balloons make for fun games, as do water guns. If you have the space a slip and slide is a fun activity but be advised many an adult has jumped in on this one. Ring toss, horse shoes, croquet, badminton are all old standby favorites. 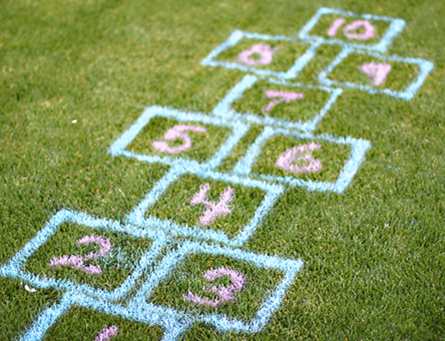 Kids can play twister on the grass. Paint using a circle stencil with washable kids paint. Making the barbeque fun for the children will always make it fun for the adults because they can relax and enjoy themselves while their children are having a good time. Fourth of July is coming up, I hope this helps with your grilling and throwing backyard barbecues. Pingback: Easy steps for GRILLING | Cook, Party, Enjoy!